The US healthcare industry is one of the biggest in terms of expenditure and breadth, and arguably the most complex and challenging both at a macro and micro level. Healthcare expenditure in the US amounted to 18.1% of US GDP with combined public and private spending of $2.84 trillion on healthcare as of July 2012 according to Altarum Institute figures. The healthcare industry itself is supplied by various other industries such as Medical Equipment, Pharmaceutical (Supply side) and Healthcare Provision, Insurance (Public Consumption), which help to contribute towards meeting the increased demand for medical services in the USA. These industries are highly interrelated as shown below and form the basis of a network of companies that can react negatively to adverse conditions within the wider economic climate. 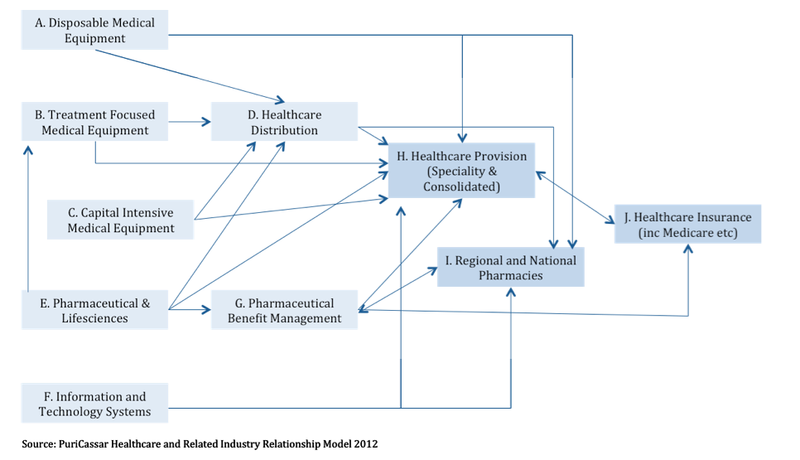 Insurers(both government and private) who provide different levels of care such as through one physician or a network. These companies provide the repayment for the care provided. It may seem that US Healthcare and related industries (The health matrix) have enjoyed a return to financial health since 2008. This trend has been supported with several medical device manufacturers (in contrast to declining healthcare provision earnings) registering higher year on year revenues and profits, as hospitals have increased patient volume and therefore require more equipment. Acquiring Strength To Weather The Storm? There is also a parallel trend of companies within both industries conducting increased M&A activity in 2012 with M&A activity up 5% in Q2 2012 in comparison to Q1 according to Berkley Noyes, an investment bank. This activity aims to expand their footprint within the health matrix, such as Aetna (NYSE:AET) a private health insurer purchasing Coventry Health Care, a private Medicaid/care programme health insurer worth $5.7billion. Additionally, in 2012, DaVita Incorporated, a Renal care provider (NYSE:DVA) finalised the acquisition Healthcare Partners a managed care business for $4.4billion. According to PWC, consolidation has been driven by cheaper company prices since the Great Recession of 2008. This is on the back of less expensive and constrictive debt terms in comparison to 2008, which has allowed companies to leverage up and make strategic purchases to strengthen their place within the marketplace. The main question here is whether companies are taking advantage of favourable market conditions and strong balance sheets or preparing for impending issues in the foreseeable future? For example there are already signs at a local level (as stated by the Boston Globe) that struggling hospitals are surviving through consolidating or being acquired by larger industry players. There are several macro and micro factors that will make the approaching fall from grace more pronounced especially in light of the share price rises of the last year. The first of these is the effect that 'Obamacare' and resultant increase of Medicare/aid patients within the healthcare system will have upon the Health Matrix as a whole. As the healthcare providers get more government sponsored patients their revenues will fall as the payments are linked to specific targets, worth less and are harder to reclaim. This is in contrast to private healthcare revenues, which often provide a higher percentage of revenues. The elephant in the room here is uninsured or underinsured patients, who due to generally only having treatment when required, provide a larger cost burden on the US healthcare industry. This demographic was meant to be eradicated with 'Obamacare', yet as coverage benefits are being cut on a state level and there are people that are still too poor to afford costs with, in Medicare/aid, there will still be a large amount of underinsured and uninsured people. According to Tenet Healthcare (NYSE:THC) this segment only repay 23% their healthcare costs, which strains the revenue streams thus putting companies like Tenet in a weak position and presenting an opportunity for short trades. The revenue reduction for Healthcare Providers will create extra strain on the supply chain of the Health Matrix as the rebate structures and the contract tenders will attempt to be renegotiated to reclaim the losses from the government. In addition, the extra burden of senior debt within the industry could compound the negative factors for healthcare providers as they may struggle to repay interest payments due to reduced revenues. This will increase the cost pressures on suppliers and amplify the tensions between providers and insurers, as premium costs are likely to be renegotiated in favour of covering escalating costs. This is particularly apparent when looking at the declining US economic situation with steady unemployment at 8.3%, although this is susceptible to distress such as the ridiculous federal and state government deficit levels which could bring further cuts to the healthcare sector pending the 2013 federal budget and looming 'Fiscal Cliff'. State deficits are a particular area of concern as 31 states according to the Centre of Budget and Policy Priorities, are under severe financial pressure and have large deficits. 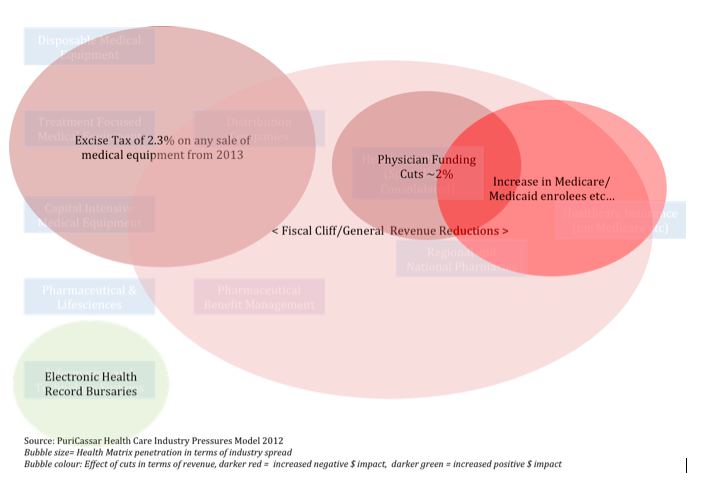 This affects the funding for Medicaid as there are fewer funds available to fund expansion. This ensures that under increased economic distress one by one as state budgets are released (in Q2 2013) cuts to Medicaid will affect the repayments received by Healthcare providers within that area. This presents an opportunity to "short" companies that have a large per hospital exposure to states at risk. Tenet Healthcare is such a company. The company has wider problems; notably a high debt to equity and revenue ratio, and they have exposure to many states within the USA (17% of bed in California, according to a Bank of America analyst research note on the industry). This shorting opportunity should come to light once state budgets are defined for FY2014. As a hedge any healthcare provider with a large percentage of international operations should provide adequate cover to state Medicaid cuts. The 'Fiscal Cliff' and the tax repeals and subsequent distress on personal finance is likely to push more companies to reconsider their expensive healthcare benefits and push more people into having either government subsidised care or no coverage. The effect of this on the Health Matrix will be gradual but deep, as more people switch providers (affecting insurers). As a result Healthcare Providers will gain less remuneration for the care that they provide and will have an increasing number of doubtful accounts. Companies such as DaVita will be affected by this and should be monitored for downside share price potential, especially due to their weakening position in the industry. For 2013 there are two key regulations that aim to recoup funds for the government, they affect both the public consumption and supply side areas of the Health Matrix. The first is the Physician funding cuts in federal Medicare funding that are capped at 2%. This regulation is likely to reduce revenues considerably owing to the patients using Medicare increasing in volume. Healthcare quality may also suffer amounting to repeat admissions at greater cost, especially when considering the elderly. The second regulation is a 2.3% excise tax upon the sale of medical devices, looks set to decrease revenues and long term innovation for the Medical Equipment industry. As a result the costs will try to be reclaimed upstream, creating greater price pressure between every industry link. It is not all bad news for the Health Matrix in terms of regulation, for the Healthcare information Technology sector, there are increased sales owing to government bursaries for Healthcare Providers installing more efficient healthcare Electronic Health Record systems. Companies such as Cerner (CRN) have seen their income statements and backlogs boosted by compliance by Healthcare Providers in 2011/2012 in order to gain the $2 million worth of bursaries on offer per hospital. The caveat of this solid performance is that in 2016 these incentives run out, yet the incentives started in 2011, ensuring that many companies already are installing systems. Once the macro problems become apparent many Healthcare companies will cut their large capital purchases and delay payment decisions, this will especially affect the Healthcare Information Technology sector as they have already fulfilled orders for several companies, ensuring a declining backlog once these effects take place. The diagram above summarises our viewpoint on how far reaching the factors mentioned in this article will be. It is likely that the area that will cause the biggest strain is the increase in Medicaid/care patients as a result of 'Obamacare'. This will create a gradual throttling of the industry with the Healthcare Providers and Health insurers being hit first. The 'fiscal cliff' effects will be similar in nature but may not have a devastating effect due to Healthcare being high on personal budgeting priorities, the overall effect increasing Medicaid/Medicare patients and the option of politicians 'kicking the can' regarding the tax cut dates. The other industry specific regulations will have a greater effect on the micro level with the fallout of these regulations spreading gradually (in the form of cost pressures) across the industry towards an already strained Health Provision sector. It is likely with all of the constraints that this sector is under that events that unfold here could prove to be the catalyst for implosion. The greatest fear in the short to medium term for the Health Matrix is the unknown. It is clear that the Health Matrix presents a great opportunity in terms of an area to reduce the deficit, with a presidential election looming. Political pandering and posturing by both parties means that although some regulations are fixed (e.g. 2.3% excise tax) the 'Fiscal Cliff' and 'Obamacare' are not and may have a severely different and bleaker risk outlook in months to come. The healthcare matrix as a whole is likely to be hit disproportionately due to the plethora of problems faced above. This has been masked in recent months by strong upwards movement in healthcare stock purchases, fuelled by a movement to consumer staples within the stock buying cycle and presidential debate fuelled positivity. In order to hold a healthcare related portfolio that has some solidity during this period, companies such as Baxter (NYSE:BAX) and GlaxoSmithKline (NYSE:GSK) should be held as they are more of a long term investor's position so will have less fluctuations and are well diversified to withstand budget cuts and pick up the pieces left by other companies. Yet, the problems as stated above are still apparent, just being delayed (in terms of price) with a higher share price to ensure any share price reduction returns bigger gains for those who are short. We believe that after the US election, whilst still within earnings season the opportunities to short the healthcare index (NYP.ID) are the greatest, and should reap considerable rewards leading up to the fiscal cliff uncertainty. For those who prefer not to place short trades or to use as a hedge. Healthcare matrix companies with considerable international exposure will continue to do well at least short-medium term depending on their fundamentals. Companies such as Pfizer (NYSE:PFE) have strong global demand and are fairly immune from credit shortages, until another recession driven 'credit crunch'.